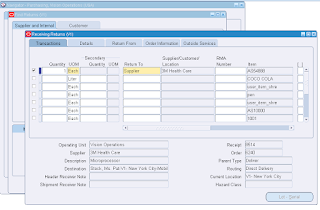 Purchasing allows you to perform returns to suppliers and returns to customers in the Receiving Returns window. Use the Receiving Returns window to return delivered items to receiving and to return received or delivered externally sourced items to the supplier if the purchase order has neither been cancelled nor final closed. you must specify lot numbers, serial numbers or locators, as appropriate. If the Quality module is installed, you can enter quality information. 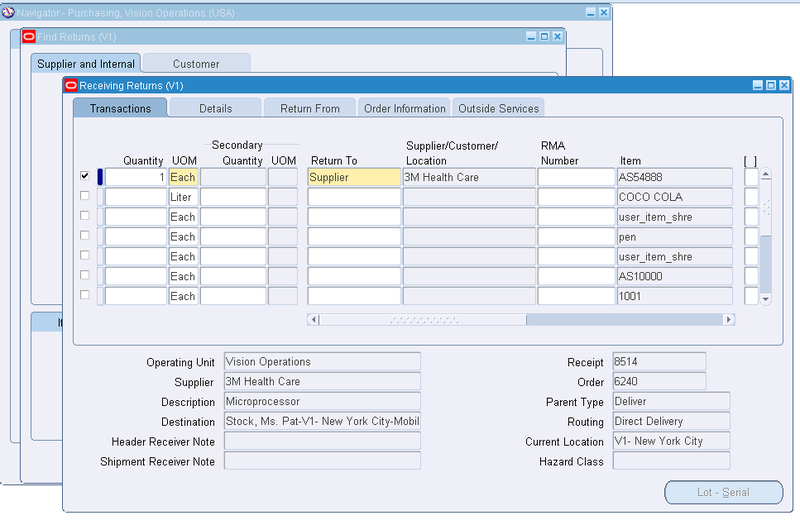 Use the Receiving Returns window to return items back to a customer. For example, a customer returns to your company a part that does not work properly. You receive and fix the part, then return the part to the customer. You cannot enter returns for internal shipments. RMAs cannot be returned to the customer if the material has been delivered to Inventory.